Seven lines of text closes a Canadian Coast Guard station after fifty continuous years of operation. No fan fare, no big end celebration of all that has been achieved, just seven lines of rather dry text. We must hold the government accountable for this. Lives will be lost. Environmental issues will be left unchecked. Our National and regional security just got weaker and once again, for what? Mr. Harper, if you are listening, Vancouver is a year round boating city. There will be lives lost from this and I urge you to reconsider. While it may look good on a spreadsheet, this is one of the busiest waterways in Canada. We have oil tankers running in and out of some of the narrowest passages in the country. 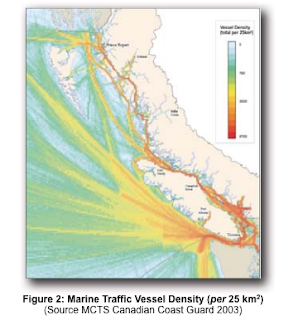 In fact, look the the Coast Guard's compiled traffic heat map. Please re-open the Coast Guard now. The heaviest traffic is exactly where the Coast Guard station is.